In many countries where the bacterial infections syphilis and yaws are found, there is limited access to diagnostic testing. Now, researchers have tested the use of a point-of-care test for both syphilis and yaws, which allows testing in rural areas without development of infrastructure. Their results appear this week in PLOS Neglected Tropical Diseases. Syphilis remains an important caused of morbidity and mortality worldwide, and is one of the major preventable causes of stillbirth. Stillbirths and neonatal deaths due to syphilis are preventable, but require appropriate screening. WHO is also targeting yaws for eradication and has identified improving the quality of diagnosis as a priority for endemic countries. Blood tests that require labs with electricity and appropriate equipment are the standard way to test for both syphilis and yaws. 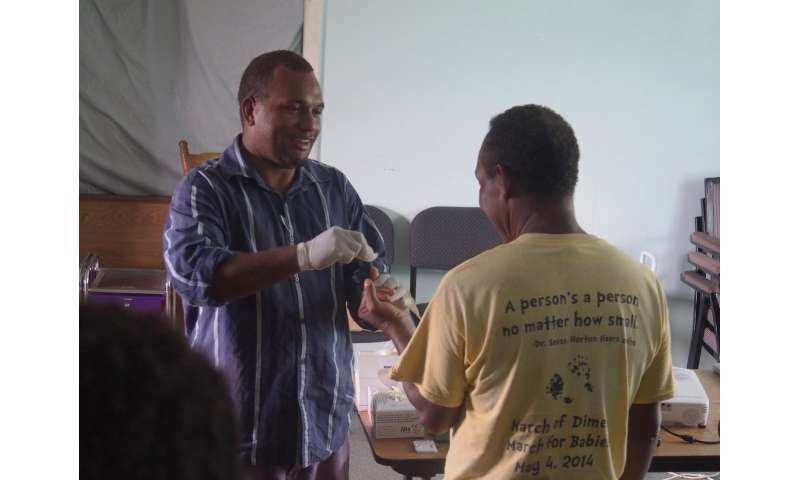 Michael Marks of the London School of Hygiene & Tropical Diseases, and colleagues tested Dual Path Platform (DPP-POCT) Syphilis Screens tests in patients to rural clinics and a hospital in the Soloman Islands. Results from the test is available in less than half an hour with no electricity or special equipment needed. Its sensitivity and specificity has been tested in the past, but not its implementation in a real world setting. During the study period, DPP-POCTs were used at four clinics and Atoifi Adventist Hospital, and healthcare workers and patients were interviewed about their experiences using them. While some healthcare workers reported that the length of time it took to wait for DPP-POCT could disrupt the workflow in the clinical environment, all healthcare workers felt that the time for the test is still favorable compared with waiting a week for results of normal laboratory tests. Healthcare workers were generally confident in the results given by the test, and patients were satisfied with the speed and convenience of the in-clinic testing. "Our data highlight the ability of these tests to improve access to diagnostics for patients in remote communities, and the receptiveness to the test of healthcare workers and patients," the researchers say. "Longer term and larger evaluations of DPP-POCT would be valuable to assess the impact and cost-effectiveness of scaling up access to the [test]."